The 24-station Jurong Region Line (JRL) will open from 2026, ramping up transport connectivity in Jurong, as it is transformed into a home for new towns, a second Central Business District (CBD) and an innovation district. The 24km above-ground line will also serve residents in the Choa Chu Kang, Boon Lay and future Tengah estates, boosting accessibility to schools, industrial areas and the Nanyang Technological University (NTU). The medium-capacity JRL will use smaller train cars, which can carry between 150 and 200 commuters, compared with cars on other MRT lines, which have a capacity of more than 200. While JRL trains will have three cars each, a fourth car can be coupled to increase capacity. 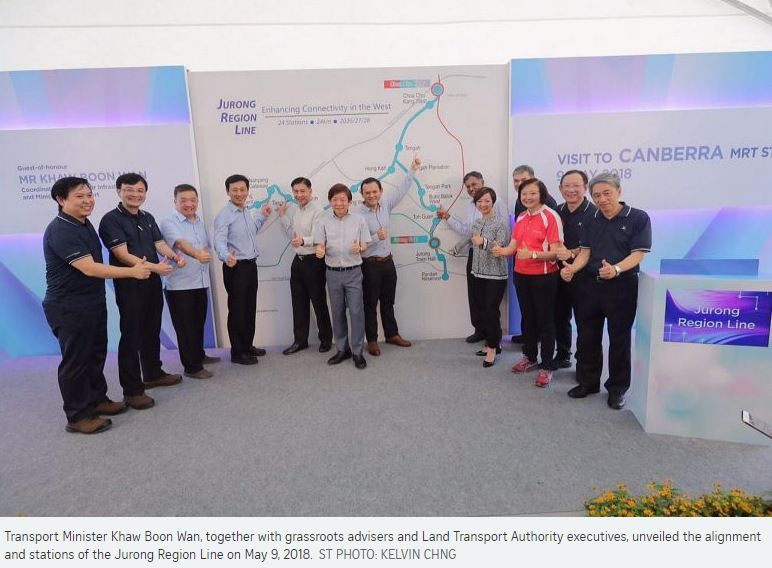 Transport Minister Khaw Boon Wan, who unveiled the JRL's alignment yesterday, said the line "marks a quantum leap" in the development of Jurong's transport infrastructure. 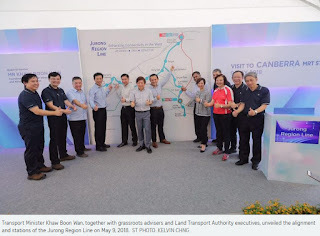 During a visit to the site of the North-South Line's future Canberra station, Mr Khaw said in a speech that the JRL will improve the resilience of the entire MRT network. He said the JRL's two interchange stations at Choa Chu Kang (North-South Line) and Boon Lay (East-West Line) will offer commuters alternative travel routes, redistributing and relieving train loading between Choa Chu Kang and Jurong East stations. 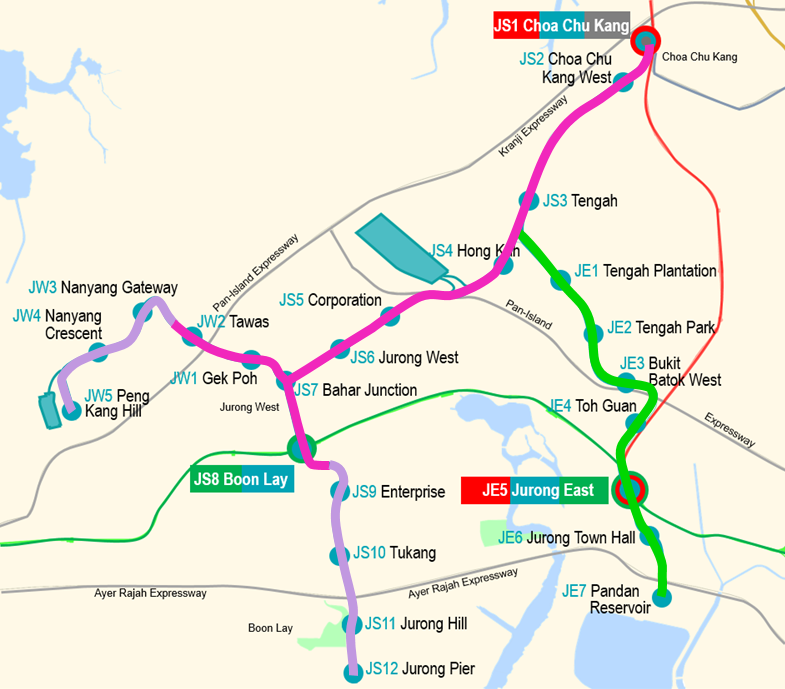 The JRL has a third interchange station at Jurong East, which links to the East-West and North-South lines. 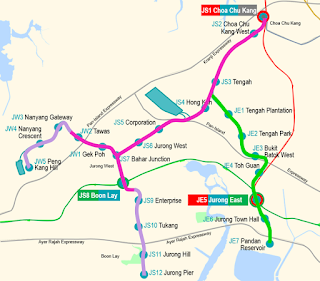 A commuter going from Choa Chu Kang to NTU will have a shorter journey of 35 minutes with the JRL, saving 25 minutes. The JRL system is designed with a headway, or train interval, of 90 seconds. The authorities plan to run the trains at intervals of between two and three minutes at the start. There will be two services - an eastern and a western route. The JRL, Mr Khaw said, will go towards achieving the Government's vision for Jurong. It will help develop Jurong Lake District into the largest commercial hub outside the CBD and support the development of the future Jurong Innovation District. When these are fully developed, the JRL is expected to carry more than 500,000 commuters daily. The JRL's opening also dovetails with the Kuala Lumpur-Singapore High Speed Rail in Jurong, which is targeted to be ready by 2026. Construction for the JRL is expected to start early next year. The first phase, to open in 2026, will be the JRL (West) segment comprising 10 stations linking Choa Chu Kang to Boon Lay and Tawas. The second phase, to open in 2027, will be the JRL (East) segment with seven stations, providing connectivity between Tengah and Pandan Reservoir. The final phase in 2028 will see the line extending farther into the west to NTU and Jurong Pier in the south. Yesterday, Mr Khaw also said that Canberra station - between Yishun and Sembawang - will open by December next year. Asked about the JRL's unique alignment, National University of Singapore transport researcher Lee Der-Horng said it is designed to match the demand in the built-up areas and the future earmarked developments. Costs are likely the reason why the line is not being built underground, he said. "It is good to have the flexibility to expand the capacity from three to four cars. It is a reflection of the future ridership growth," he added. The announcement of the new Jurong Region Line (JRL), which will serve residents in Choa Chu Kang, Boon Lay, Jurong and the future Tengah development, is a long-awaited one for many. "I was starting to feel like we were forgotten," said Ms Kang Zi Xin, a 21-year-old student who lives at Block 920 in Jurong West, a short distance away from the future Nanyang Gateway MRT station. It currently takes the Republic Polytechnic student 90 minutes to get to her school in Woodlands. The JRL is expected to serve more than 200,000 commuters in its initial years. The 24km line will also connect upcoming areas such as the Jurong Innovation District. Nanyang Technological University's (NTU) president, Professor Subra Suresh, told The Straits Times: "This is certainly a welcome development for students, employees, alumni and visitors. The new MRT line will play an important role in Singapore's vision for Jurong, including the development of the Jurong Innovation District, in which NTU will be a key player." The sentiment among residents in these areas is that getting around Singapore will be made a lot easier. Many often have to take long bus rides to the closest MRT stations. Ms Seah Lay Khim, 59, who lives in Choa Chu Kang West, often has to wait 20 minutes for her bus to Choa Chu Kang MRT station. "There are just too few buses in this area," the retiree said. "Just getting to the Choa Chu Kang station can take up to half an hour." West Coast GRC MP Foo Mee Har said the Pandan Reservoir station will benefit residents in her Ayer Rajah ward. "We will just be a hop, or two stations away, from Jurong East," she said. 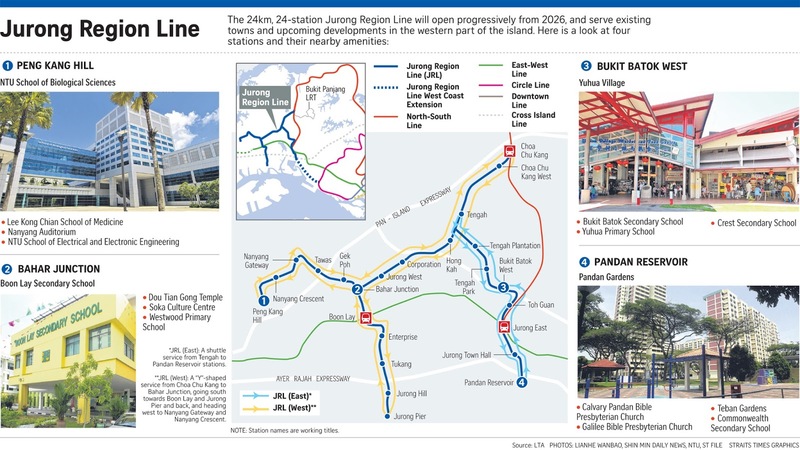 "They can connect to the North-South Line and East-West Line, as well as use the JRL to connect to the Jurong West industrial area and Jurong Island." As parts of the JRL will extend into existing residential areas, Jurong GRC MP Ang Wei Neng hopes that barriers will be erected at construction sites to keep noise to a bearable level. "Sound barriers should also be erected on the MRT viaducts to minimise the noise from trains passing by, right from the start," Mr Ang added. The building of the JRL will involve the acquisition of 24,000 sq m of land. This will include a Housing Board multistorey carpark with shops in Choa Chu Kang Avenue 4. The site can be used until Nov 29 next year. The row of shops on the ground floor of the carpark is popular with residents in the area. "I know the older folk who visit this place will be really sad when it is gone," said Mr Alex Chua, 21, who works at the Offer and Save Department Store there. "A lot of them gather at the foodcourt to chat. Some even travel from Yew Tee to meet their friends here." Ms Shan Yoke Yin, 55, who has worked at one of the stores - O Bread 2 - for almost eight years, said it will be "a pity" when the land is acquired. "I have become such good friends with my regular customers and the other shop owners here," she said. Another 19 plots of land will also need to be taken over, but these will be partial acquisitions which affect only ancillary features such as green verges, boundary walls and fencing. The future Jurong Region Line (JRL) will use specially designed carriages which are smaller in size than those found on other MRT lines to give the trains more manoeuvrability on the tracks. This is because the 24km, 24-station JRL is built above ground and its alignment has been designed to navigate the existing developments in built-up areas, the Land Transport Authority (LTA) said. "The smaller train cars would allow the trains to navigate tighter curves in areas constrained by existing developments," LTA said, in response to queries from The Straits Times. The JRL, which will serve residents in Choa Chu Kang, Boon Lay and the future Tengah estate, along with new developments like the Jurong Innovation District and Jurong Lake District, will open in three phases, starting from 2026. It is Singapore's seventh MRT line. JRL trains will each have three cars, each with a length of 18.6m and width of 2.75m, LTA said. In comparison, train cars for existing MRT lines, such as the Circle Line, are 23.6m by 3.2m. In terms of capacity, a JRL train car can carry between 150 and 200 commuters, while a regular MRT car can carry between 200 and 300. JRL trains, however, will have the flexibility to have a fourth car coupled, to boost the carrying capacity. An LTA spokesman said a light rail transit (LRT) system would have been unsuitable, as it is more adapted to straight-line alignments, such as in airports. The LRT system is "less effective in coping with sharp turns and undulating terrain in built-up areas", LTA said, adding that the JRL's alignment has been designed to ensure that its trains would be able to cope with the turning radii. While newer MRT lines, such as the Circle Line, Downtown Line and Thomson-East Coast Line, are all built underground, the JRL bucks the trend by being constructed above ground - a move LTA said would allow it to build the line faster and at a lower cost. National University of Singapore transport researcher Lee Der-Horng said the route of the line and future plans for Jurong might have contributed to LTA's decision. He said that given the JRL's route alignment, which is H-shaped, going underground could result in a much more complex design, compared to other lines. The Jurong Region MRT Line is a "complex project" whose 10-year implementation timeline is necessary to ensure the safety and quality of its construction, said Transport Minister Khaw Boon Wan in Parliament on Monday (Oct 1). He was responding to Ms Foo Mee Har (West Coast GRC), who had asked whether resources from the now-deferred Kuala Lumpur-Singapore High Speed Rail project could be diverted to help expedite the construction of the Jurong Region Line (JRL). The 24km JRL is scheduled to open in three stages between 2026 and 2028. It will span 24 stations and serve residents in Choa Chu Kang, Boon Lay and the future Tengah estate. Mr Khaw, who is also Coordinating Minister for Infrastructure, said there are three main reasons why the construction cannot be brought forward. First, he noted that the line will run along existing roads with many underground utilities and services, such as high-voltage cables and large-diameter water pipes. These will need to be diverted before the construction of the line can begin, he said. The main construction works of the line are also complex, he added. Second, the new line will have interchanges with the existing North-South and East-West MRT lines at Jurong East, Choa Chu Kang and Boon Lay, said Mr Khaw, noting that the new stations will have to "safely and seamlessly interface" with these existing stations. "In particular, works at Jurong East Station will involve removal of the existing steel roof structure and the construction of a new roof above live tracks and operating platforms," he noted. Lastly, he noted that certain sections of the JRL are being constructed near existing buildings and structures, and extra care is needed so as not to damage or disrupt them. "There needs to be close coordination with surrounding land and building owners. All these require time," he said. Safety in the construction of the line is the top priority, he said, adding that the Land Transport Authority does not recommend shortening the construction timeline further, even if additional resources are available. "But we will try," he said.